Support for the Big Bang as a splitting giant Black Hole. ScienceDaily (June 15, 2011) — "Using the deepest X-ray image ever taken, astronomers found the first direct evidence that massive black holes were common in the early universe. This discovery from NASA's Chandra X-ray Observatory shows that very young black holes grew more aggressively than previously thought, in tandem with the growth of their host galaxies." According to Quantum FFF theory however the last conclusion should be different. 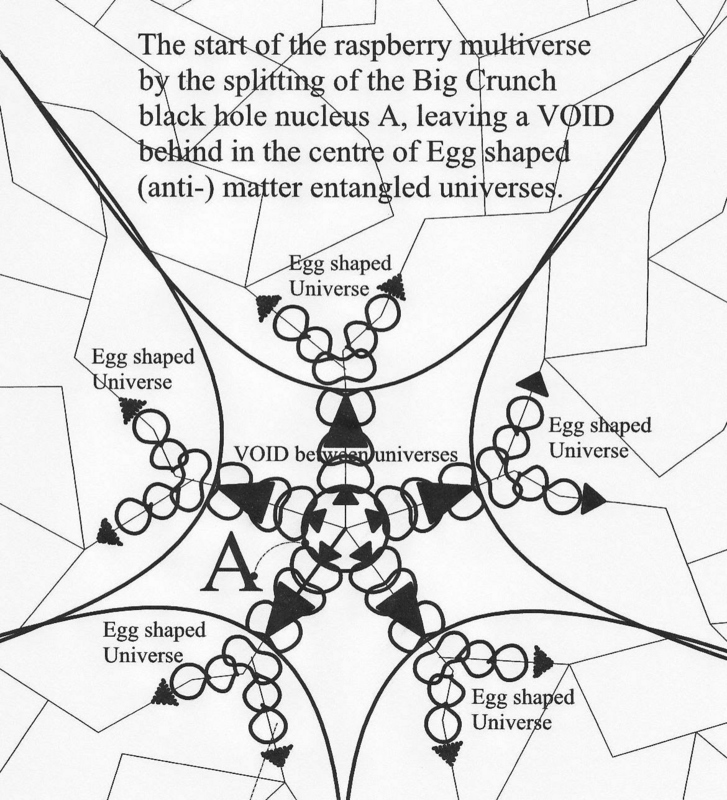 Cross section through the raspberry multiverse. 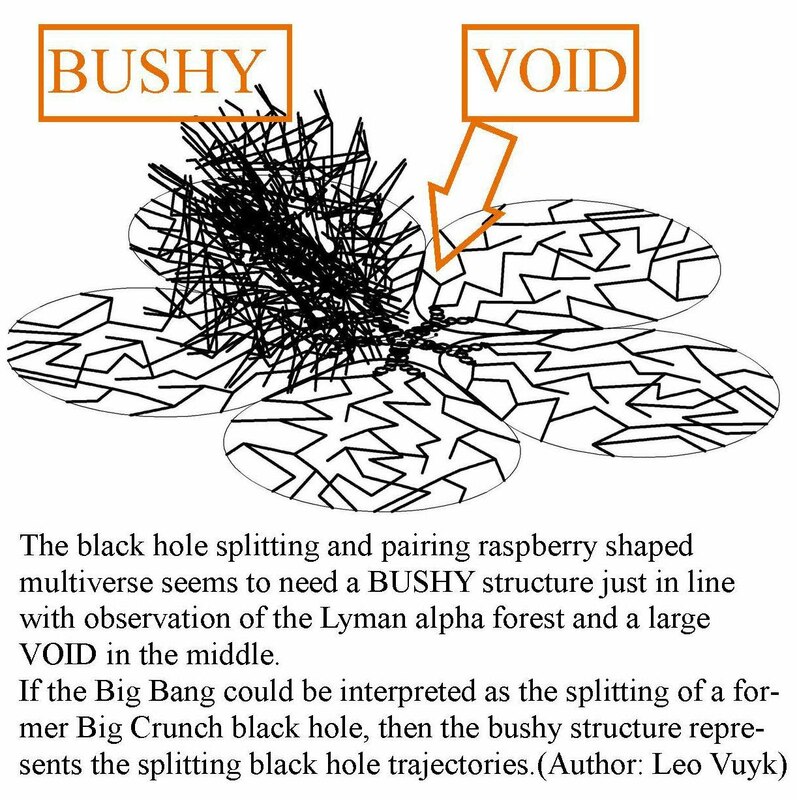 According to Quantum FFF theory however, it is NOT the Galaxy spin, But the CHIRALITY of the VACUUM LATTICE STRUCTURE THAT SHOULD BE THE ORIGIN OF GALAXY SPIN AND ALSO MATTER OVER ANTI-MATTER IN OUR UNIVERSE! However, these Counter Clockwise rotating Galaxies are observed toward the nord pole of the milky Way!!!! FUTURE observations will show the evidence. As a consequence, the origin of our universe will be located about at one end of the North-South connection line. Puyehue Volcano Production of Ball Lightning/ Micro Comets. 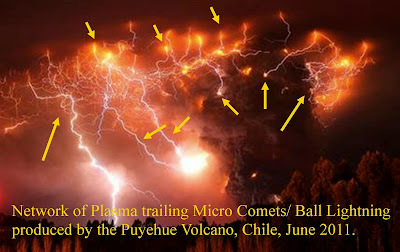 Network of Plasma trailing Micro Comets/ Ball Lightning, produced by the Puyehue Volcano, Chile june 2011. This Puyehue evidence for the ball lightning production, should be the start for a worldwide scientific research on artificial laboratory production of ball lightning. Comparison with the Slow Motion video example of a regular Lightning stroke. The Evaporating and Splitting Ball Lightnings coming down and going up. 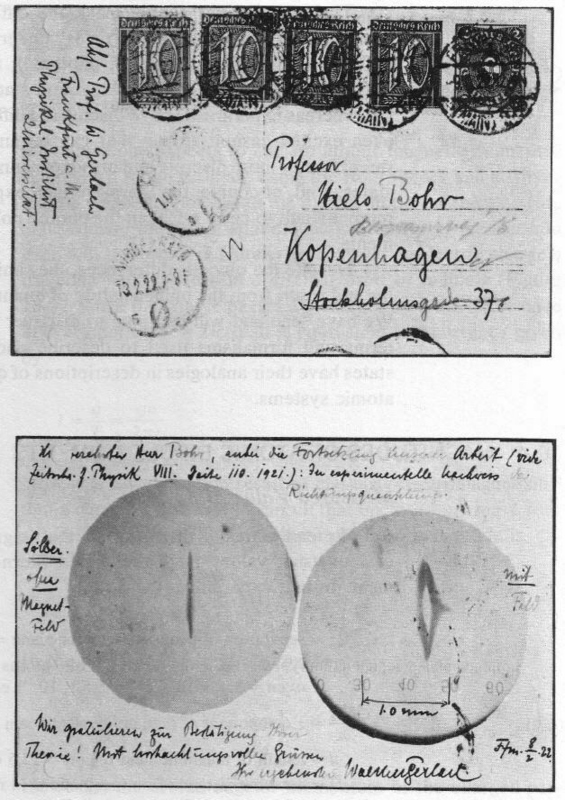 Comparison with well known Ball Lightning. 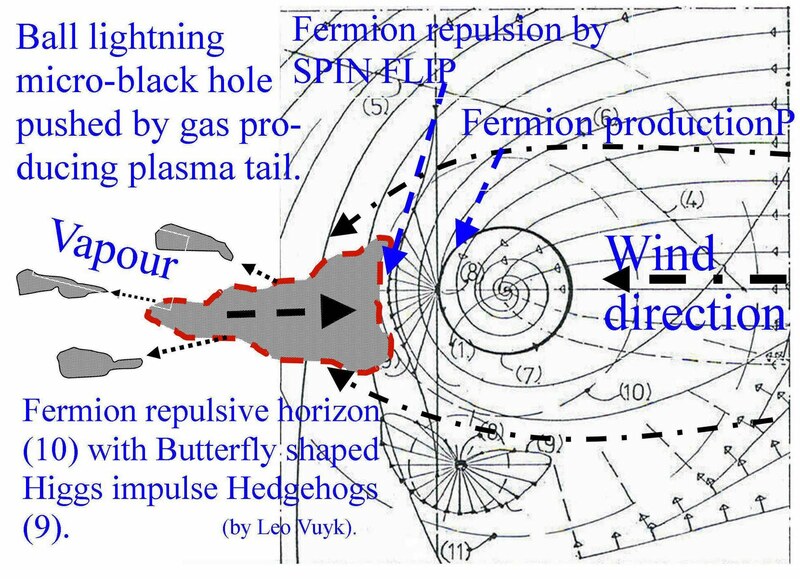 This photo is a strong support for the existence of ZPE propulsion of the micro Black Hole by a plasma tail, see below. 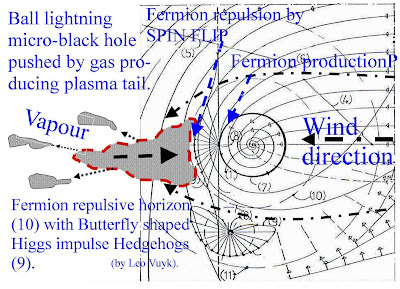 Plasma tail pushes the (new paradigm) micro black hole (Fireball) against the wind by the asymmetric Butterfly shaped Vacuum impulse Vector arrays (Hedgehogs). Example of Zero Point Energy propulsion! Inside Volcano plumes like Puyehue, it is llikely that also electro magnetic fields have influence on Fireball propulsion. 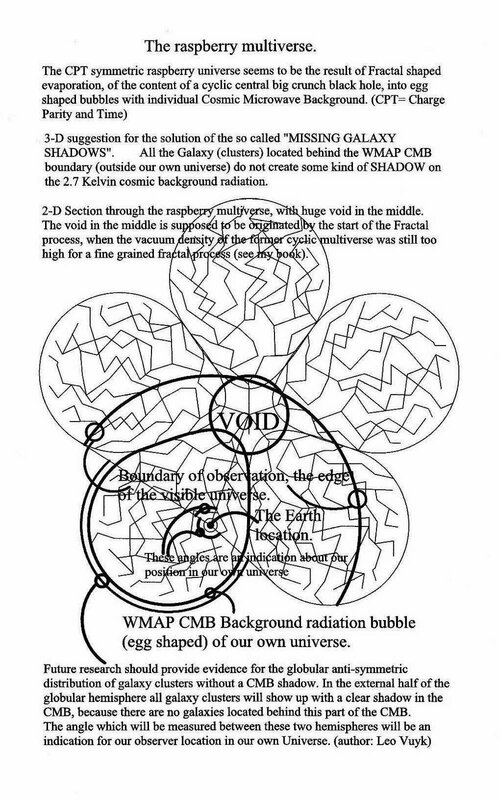 There is evidence that dark matter is all around us and the distribution is not restricted to giant black holes inside Galaxy nuclei, which would be a logical proposal. The logic however is, that black holes are proliferated in and around Galaxies from giant- down to microscopic sizes. 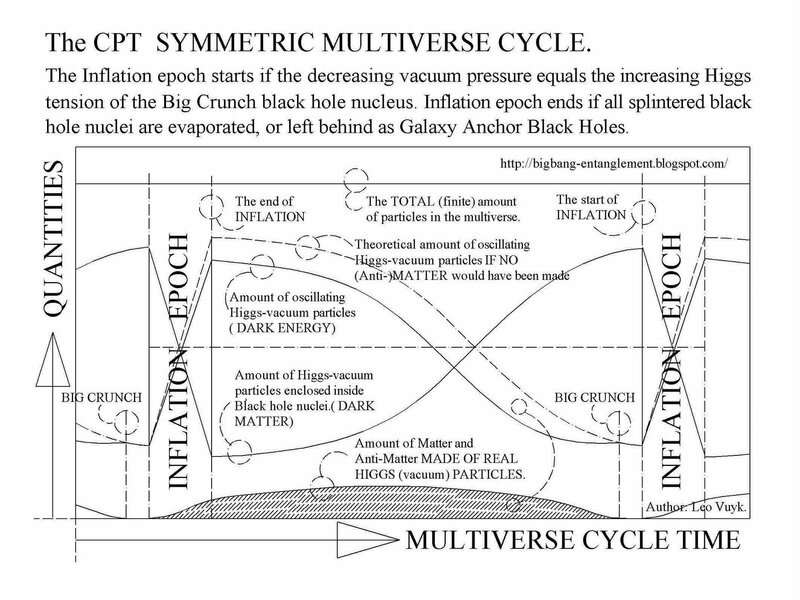 as Big Bang Black Hole (BBBH)or as Big Crunch Black Hole. The Network of plasma trailing ball lightnings in the Puyehue Volcano, resembles the Lyman Alpha forest observed as the grand matter distribution structure in the universe. 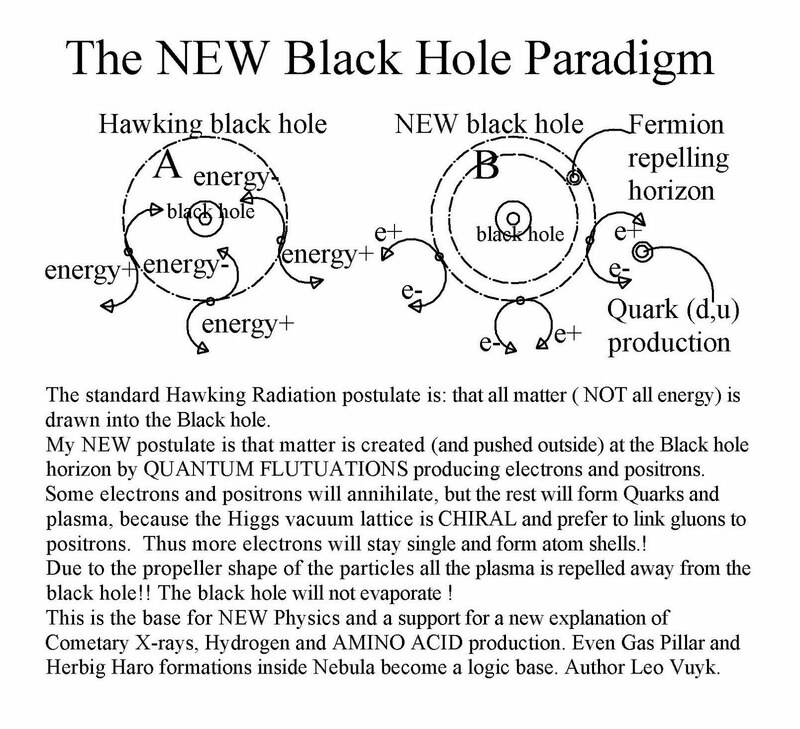 This is a support for the postulate that the Big bang was the splitting of the BBBH ( Big Bang Black Hole.) 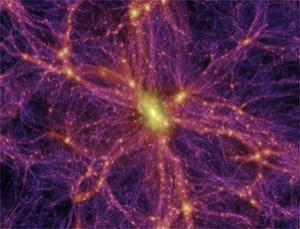 creating a network of matter by the smaller splitted- Plasma producing Black holes. see new BH paradigm below. Conclusion: All matter in the universe is created as plasma, around black holes of different sizes. One laboratory has already found a way to produce ball lightning. see: On the Large Hadron Collider found unexplained effect. 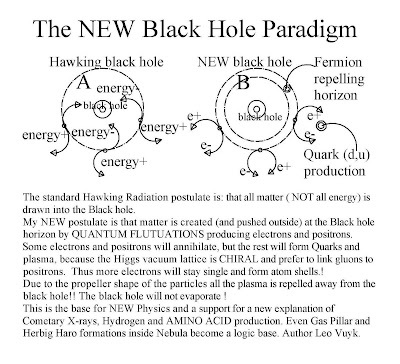 According to Quantum-FFF Theory, Dark matter, the same as Ball lightning, the same as micro Black holes or bunches of massless Higgs particles. 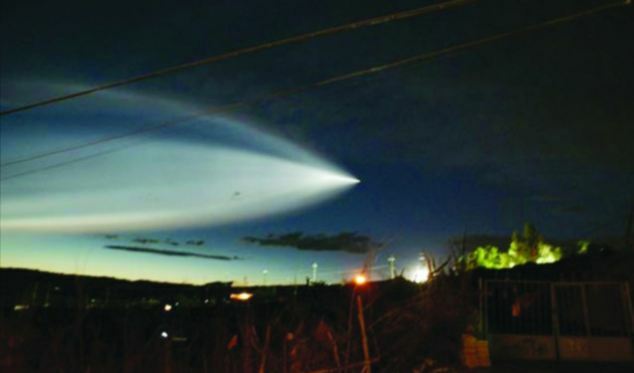 Not only the Chilean Puyehue Volcano but also the LHC ( Large Hadron Collider) in Geneva, seems to produce fireballs or Ball lightning called UFOs!!. 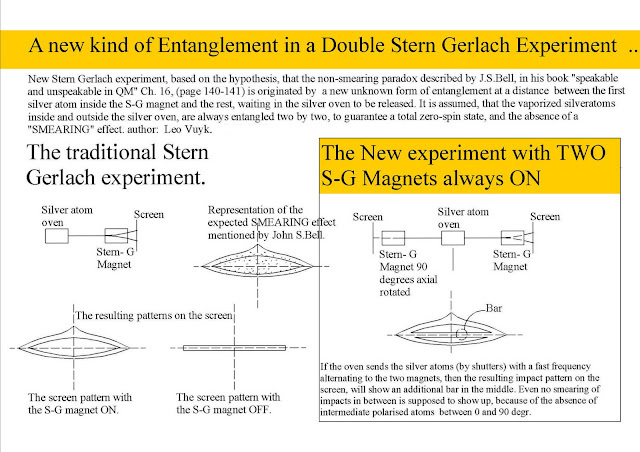 New Stern Gerlach experiment, based on the hypothesis, that the so called "non-smearing paradox" described by John s. Bell is originated by a new form of Entanglement. The new entanglement seems to be present between the first silver atom entering the S-G magnet and all the other vaporized silver atoms inside the oven or under way into the S-G Magnet. If the first atom is polarized by the magnet, the rest immediate seem to rotate in up or down position, even before entering the S-G magnet. As a result only up and down positions on the screen are observed. 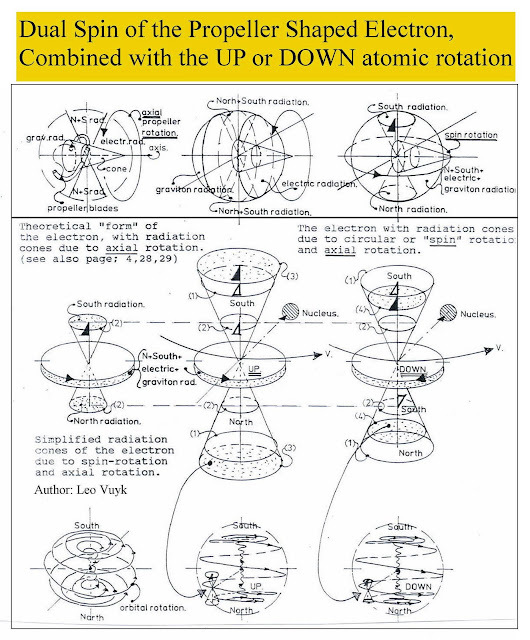 Only the first measured atom is supposed to have an at-random polarization and the opportunity to become an intermediate or "smeared" position on the screen. This would be the logic explanation, to solve John Bell's non smearing paradox. Thus it is assumed that all the vaporized silver atoms are in an active entangled state during measurement of at least one of them. 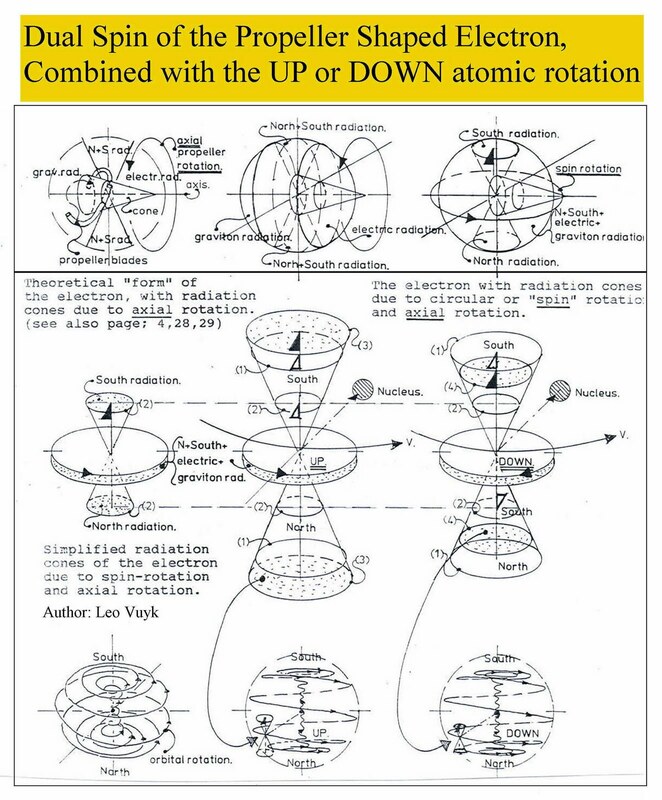 So if we could do the experiment with TWO opposing S-G magnets with 90 degree mutual rotation, a BAR should be present inside the screen picture, caused by the perpendicular spin state of the alternating first atom that enter one of the magnets. sent to Niels Bohr by Gerlach.